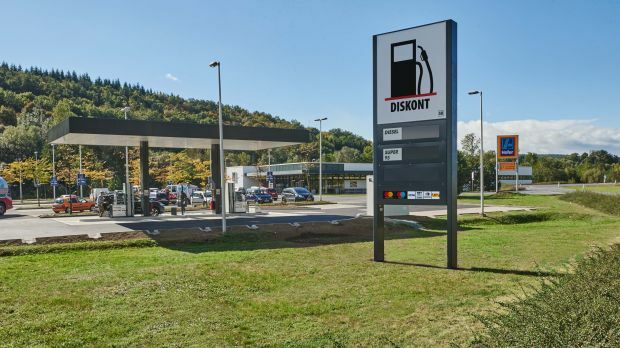 In Austria, there are currently 79 unmanned Diskont petrol stations operating next to Hofer stores. Aldi Süd in Germany has struck a deal with discount petrol station operator FE-Trading allowing the latter to operate unmanned stations next to Aldi stores. The contract between the two covers a pilot project including ten stations in and around Munich, Nuremberg and Stuttgart, an FE-Trading speaker told the German newspaper TZ. According to the paper, the stations in Aldi Süd car parks are expected to be opened by the end of the year. FE-Trading, which is a subsidiary of Austrian oil company OMV, already has a similar co-operation with Aldi Süd affiliate Hofer in Austria. There, the first station opened in a Hofer car park in Salzburg in 2009 under the name Diskont. Today, the Austrian network comprises 79 unmanned stations. In Germany, the stations will be trading under the brand Avanti, FE-Trading told LZ Retailytics. This name is already being used by the company in German standalone locations. At the ten sites, Aldi Süd is also to offer e-charging stations to its shoppers, free of charge. This is a very good example of companies coming together to create mutually beneficial synergies. Aldi Süd wants to become a one-stop shopping destination and petrol stations are an important add-on service to attract more car owners and shoppers on bulk-buying missions. Together with its assortment widening, the discounter now has more potential than ever to cater for this target group. Meanwhile OMV can expect to profit from the opportunity to sell a differentiated, low-price proposition to a wide audience without the need to scout for and develop its own plots. The affinity between the two is also perfect in the sense that FE-Trading is prepared to outbid competitors’ prices just like Aldi Süd, which matches shopper expectations of the Aldi experience. In Austria, this seems to have worked well and has contributed to the overall success of the up-trading process there. In 2017, LZ Retailytics expects Hofer in Austria to reach a sales per sq m of EUR12,326, which dwarfs the corresponding German figure of EUR7,926 for Aldi Süd and Nord combined. The market share in Austria is also forecast to exceed 16% this year, while in Germany it is expected to grow moderately to 10.6%. Naturally, Aldi seeks to replicate that excellent performance in Germany too and rolling out unmanned petrol stations to a similar number of stores, or perhaps even more, would be a great import from the neighbouring market. Recently, it has copied two other Hofer concepts; misshapen fruit & vegetables, as well as pro chef sponsored kitchenware and recipes. Nothing prevents the discounter from signing similar petrol station deals in its other markets if a suitable partner can be found. The up-trading process is ongoing in essentially all of Aldi's markets and there isn’t a lack of suitable car parks. With contributions from Research Director Matthias Queck.